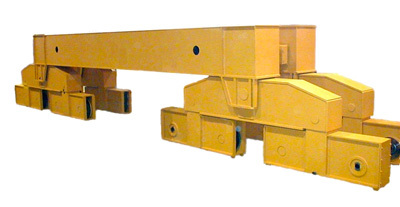 End Trucks, Model UHB Bogie for Double Girder Cranes | EMH, Inc.
UHB-250.480.5000 10 in. 11ft. 10.5in. 2×5 HP 58,450 Click for Prices. UHB-250 Specs. UHB-315.575.5000 12 in. 14ft. 10.5in. 2×7.5 HP 76,430 Click for Prices. UHB-315 Specs. UHB-400.650.5000 16 in. 14ft. 10.5in. 2×7.5 HP 92,170 Click for Prices. UHB-400 Specs. UHB-500.750.5000 20 in. 14ft. 4.5in. 2×10 HP 137,130 Click for Prices. UHB-500 Specs. UHB-630.900.6150 24.75 in. 20ft. 2.5in. 4×7.5 HP 222,550 Click for Prices. UHB-630 Specs. UHB-710.980.7200 28 in. 21ft. 8in. 4×10 HP 283,250 Click for Prices. UHB-710 Specs. UHB-800.1100.10500 32 in. 22ft. 3.5in. 4×10 HP 321,460 Click for Prices. UHB-800 Specs.